Our packing jobs at Amazon had been going well, up to this week. We were working four 10 hour days, followed by three days off. The work was somewhat tedious and monotonous…no surprises there…but we were ok with our duties. We were definitely sore, but nothing we were overly concerned about. Things picked up with Black Friday and Cyber Monday, and we were really worn out. Still we kept pushing. On Tuesday morning, Diana wasn’t feeling well…it turns out she hurt her back…and went home. I worked out the day, but pretty much settled on the fact that we should move on, as it wasn’t in our best interest health wise to stay to the end. Diana had never worked in an industrial environment before, and she was amazing. Kelly, the CamperForce human resources director, called her a natural. :). I spent my career in a shop setting, so I knew my way around. All was well with our managers…they actually came to us for assistance daily…so no issues there. We just were concerned that lugging totes with two cases of canned pet food in them while being so tired was jeopardizing our health. 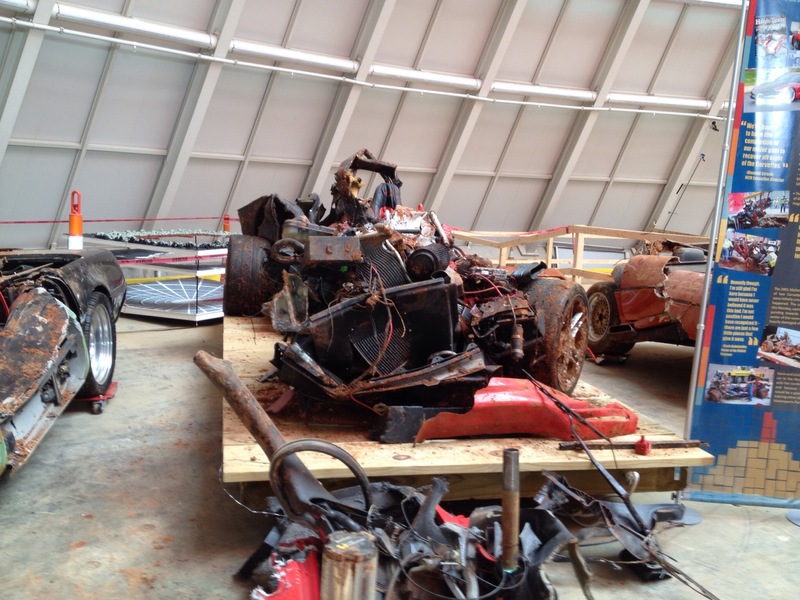 We knew it was going to be hard work going in, and it definitely was. When we let Kelly know, he offered for us to return next year, which was incredibly kind. 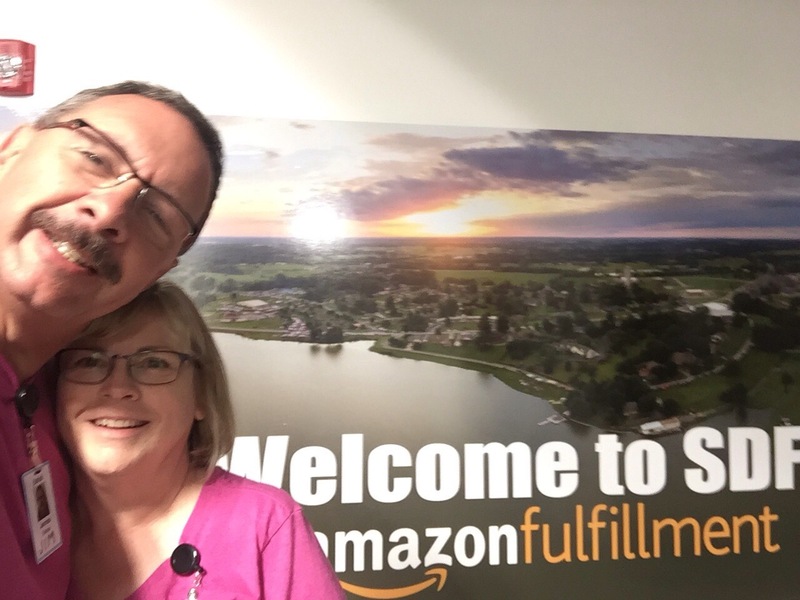 Amazon’s Campbellsville management team loves CamperForce, as they work so hard and are reliable. If finances ever dictate that we need to return, it is nice to know that offer is out there. That wasn’t our motivation this time, as we just saw Amazon as something we wanted to experience. The money was a nice bonus, though! 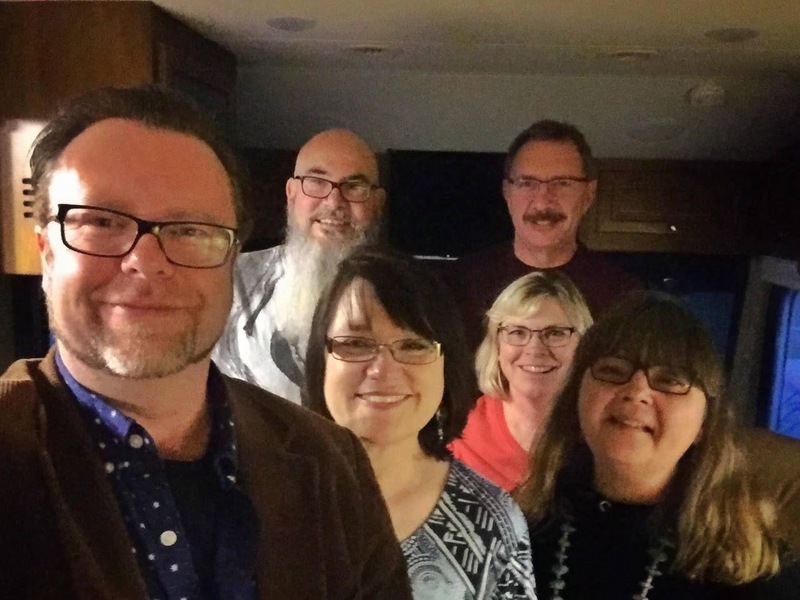 So on Wednesday night, we met up with our friends Linda and Steven at Campbellsville University’s dining hall. They treated us to dinner (thank you!!!) and we discussed the events of the week. We have gotten together with them four times since we arrived here, and have thorouly enjoyed every minute of our time with them. 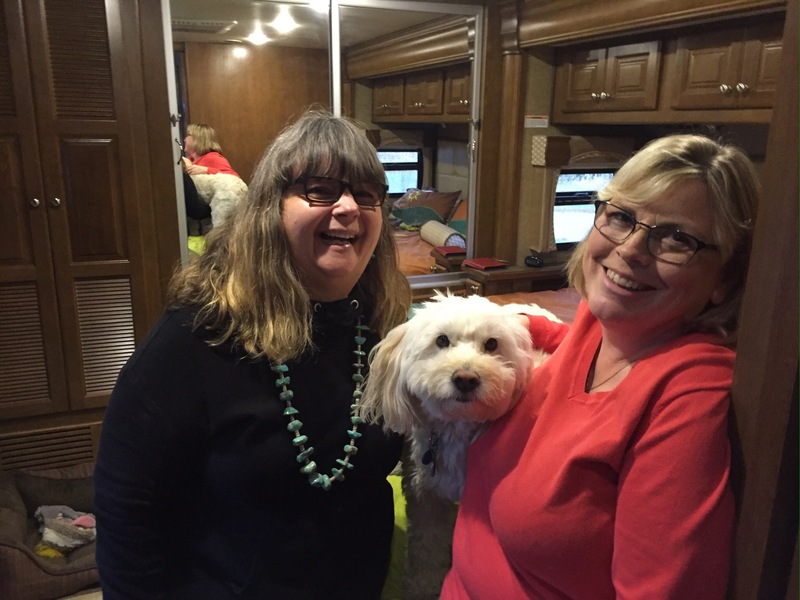 Jodee and Bill hooked us up, and the six of us…er, seven (can’t forget Fluffy Dog) spent Thanksgiving together. And we can’t forget Tessa! So…what’s next? 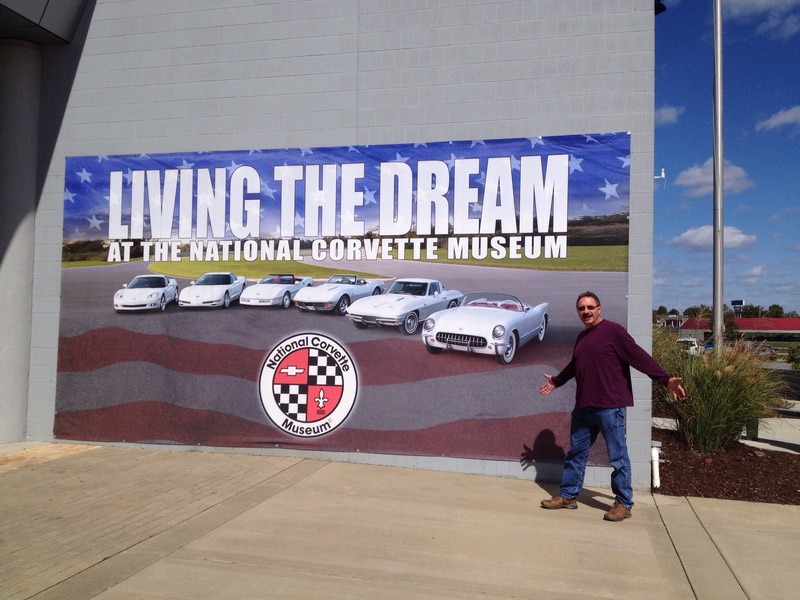 Well, first stop will be a weekend in Nashville, meeting up with Jodee and Bill again! I’m sure there will be a couple of bloggers reporting on that one. 🙂 From there we will be heading back to Melbourne Beach, Florida for three months, and we are looking forward to seeing our friends Rod and Mary (and Gracie) again! 🙂 After that, we will be exploring some new territory for us, so be sure to stay tuned to what that entails. That’s our update to what’s been happening. We really enjoyed our time in Kentucky, and really appreciate the opportunity that Amazon afforded us. CamperForce is a great program, and the people we worked for were thoughtful. We definitely knew were appreciated. This state is beautiful, the cost of living in the Campbellsville area is very reasonable and the people are warm and friendly. We would definitely come back here, even if we weren’t working for Amazon. 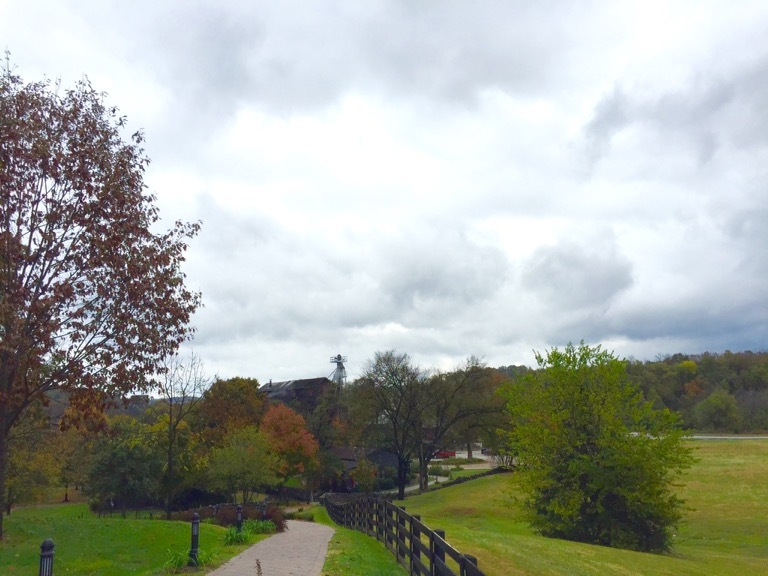 As stated in our previous post, most people think of horses when they think of Kentucky. 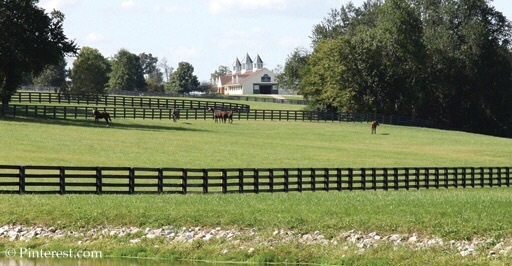 The area in and around the city of Lexington is covered with picturesque equestrian farms. Horses are revered here, with some of the barns they are housed in being more beautiful than the mansions that surround them. 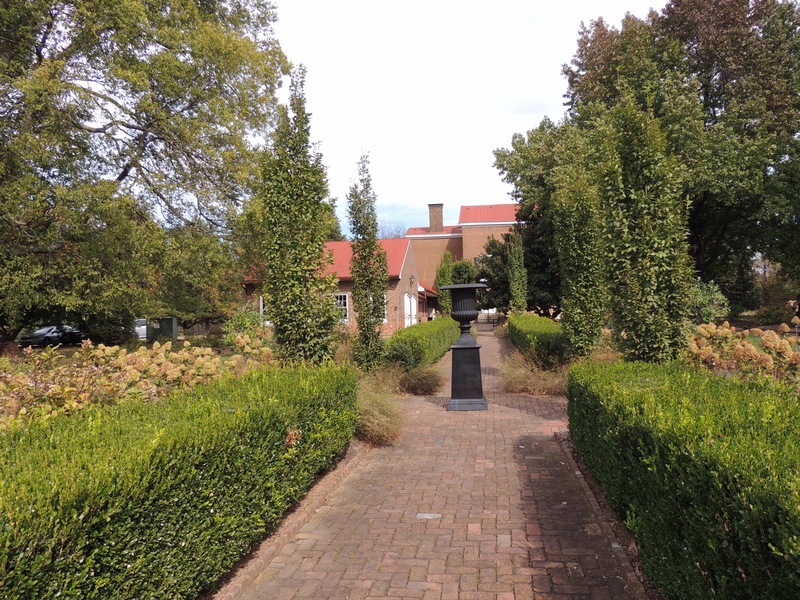 Queen Elizabeth II keeps breeding stock at Lane’s End Farms, seen in the above photo. She has visited here several times since the 1980’s. 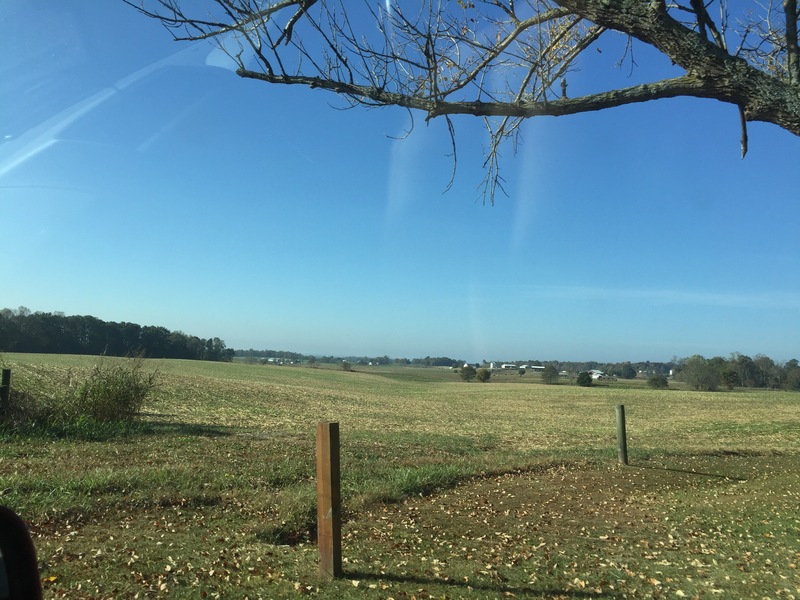 The entire area is a picture of serenity, complete with rolling meadows, miles of well-maintained fences and narrow, winding roads. 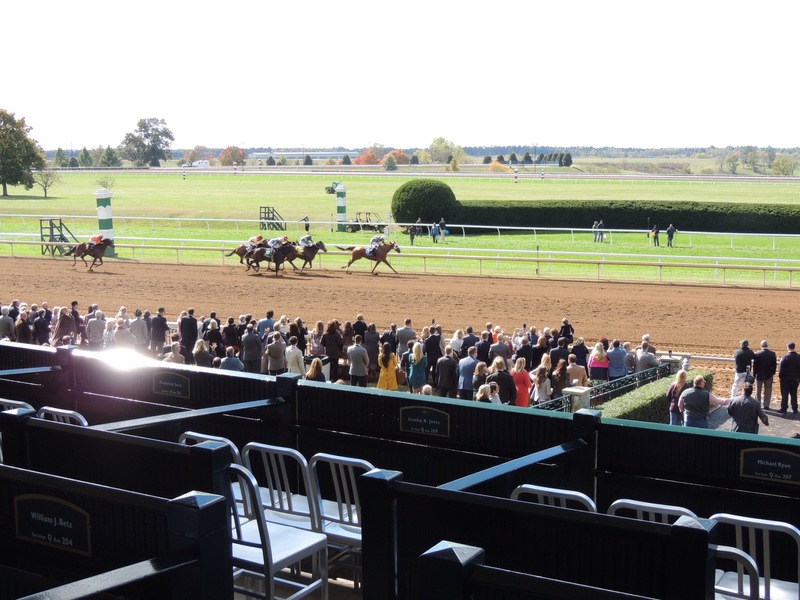 The name Keeneland encompasses several aspects of a gorgeous 147 acre piece of Lexington farmland that was once owned by a gentleman named Jack Keene. In the 1930’s, Mr. Keene was a key individual behind the organization of the Keeneland Association. 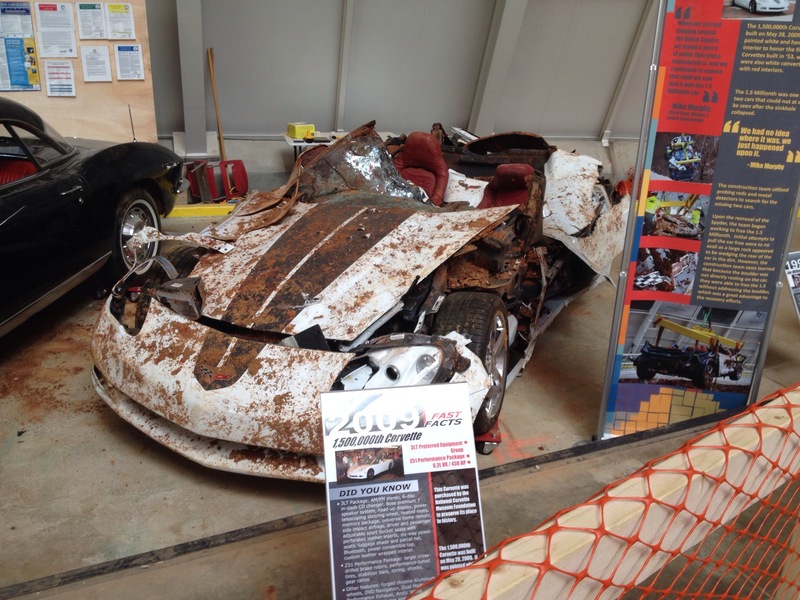 This was a non-profit horse auction and racing entity that was interested in promoting the world of thoroughbred horses. 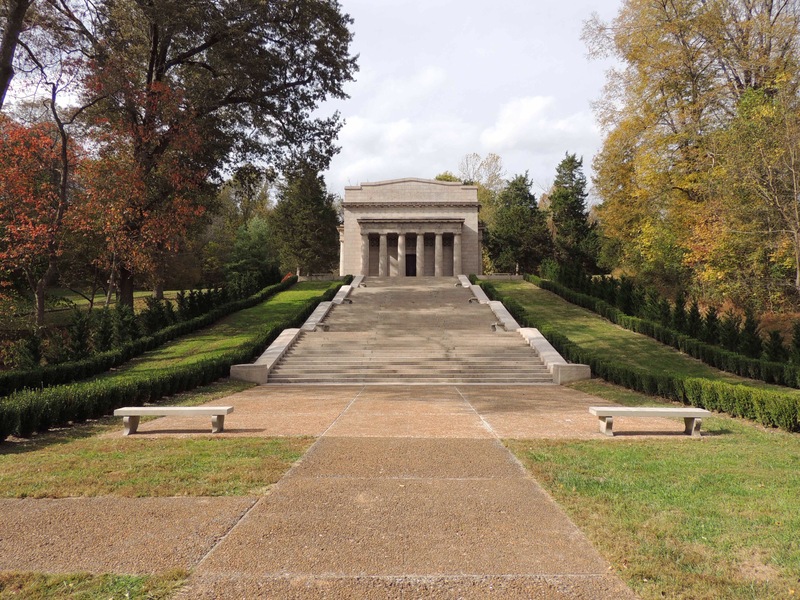 The facility was opened in 1936, and is now on the National Register of Historic Places. 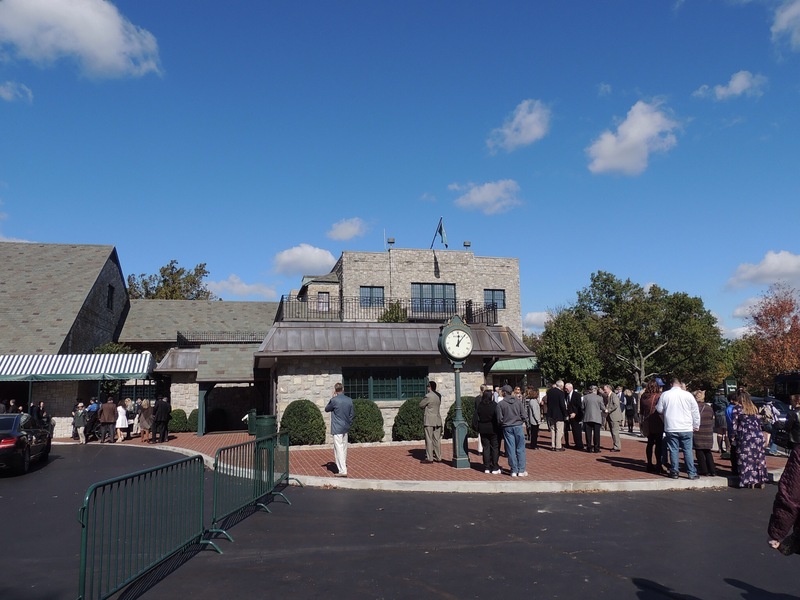 The Breeder’s Cup was run here in 2015, which was won by American Pharoh in his last race, which made him the first horse to ever win the Grand Slam (the Triple Crown and the Breeder’s Cup). The picturesque track was used as a backdrop for most of the scenes in the movie Seabiscuit, as it has changed so little since it opened in 1936. 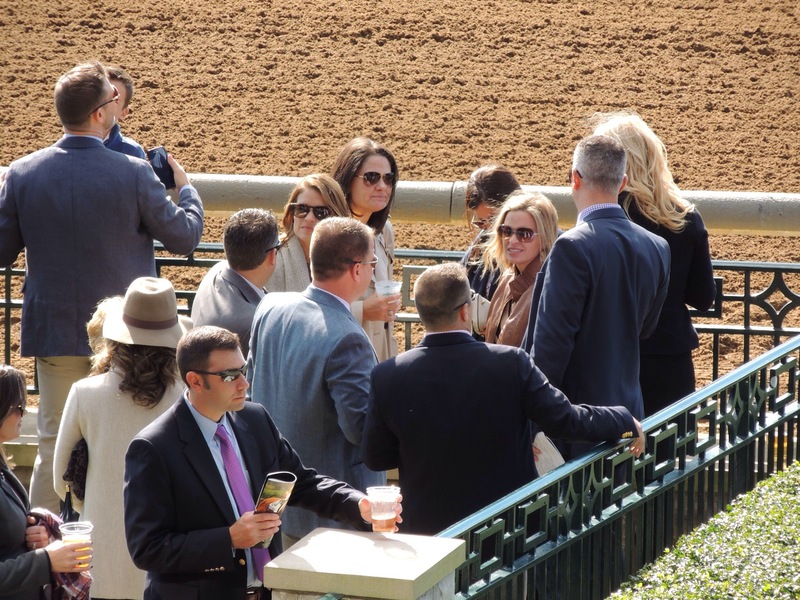 The sales side of the Keeneland Association runs the world’s largest horse auction in January, September and November. And the racing side hold meets in April and October. 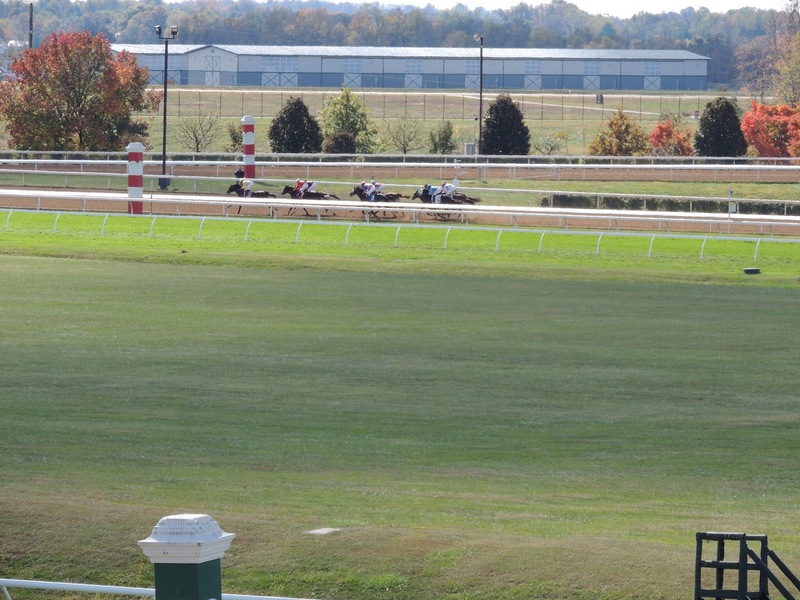 This year’s fall meet ran from October 7 through October 29. 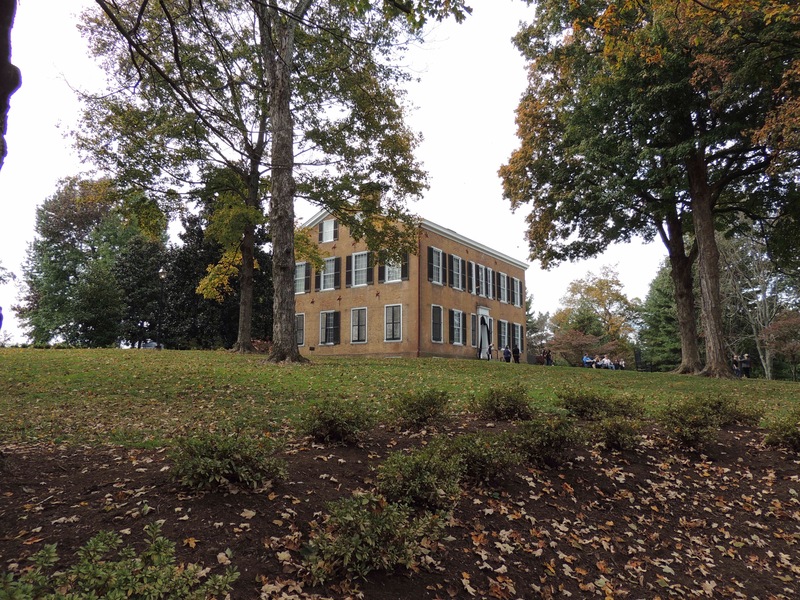 On Saturday, October 15, we drove from Campbellsville to Versailles, Kentucky to meet up with Reed, his wife Emily, and Diana’s cousin Jerry (Reed’s brother) who was also in town for a visit. 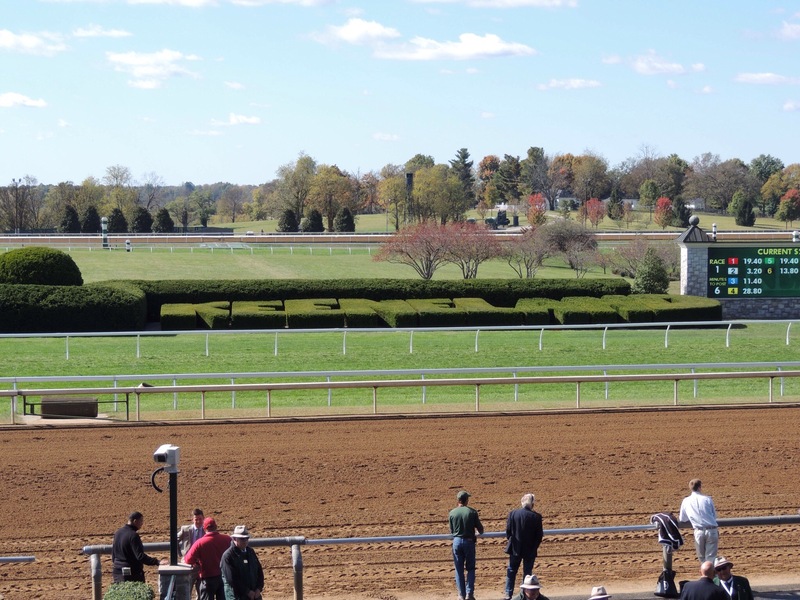 From Reed and Emily’s home, we drove some of Kentucky’s narrow, curvy roads to Keeneland. Along the way, Reed and Emily bought us lunch at Wallace Station Deli and Bakery…very tasty. Thank you both! Our first stop was the paddock. 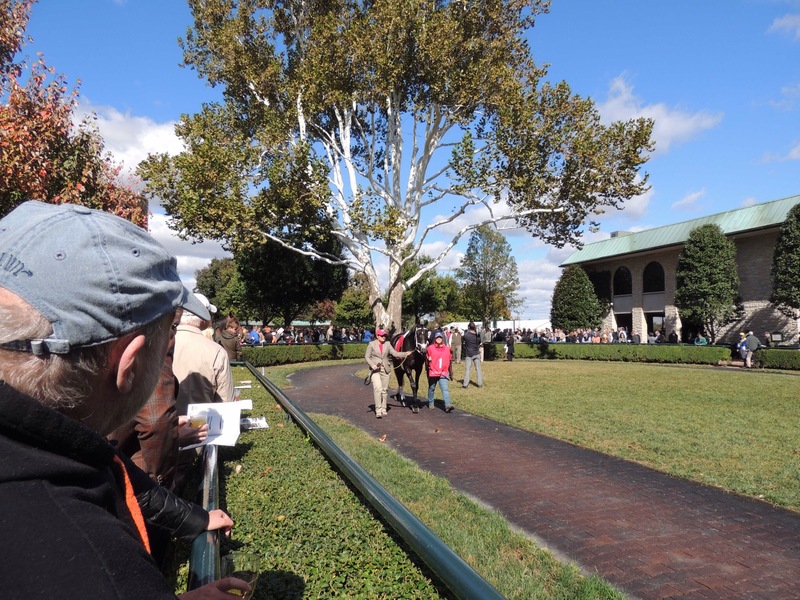 That’s where the horses are paraded around, one at a time, for the bettors to examine each race entrant. Reed filled us in on how to read a race program, how to place a bet, and so on. 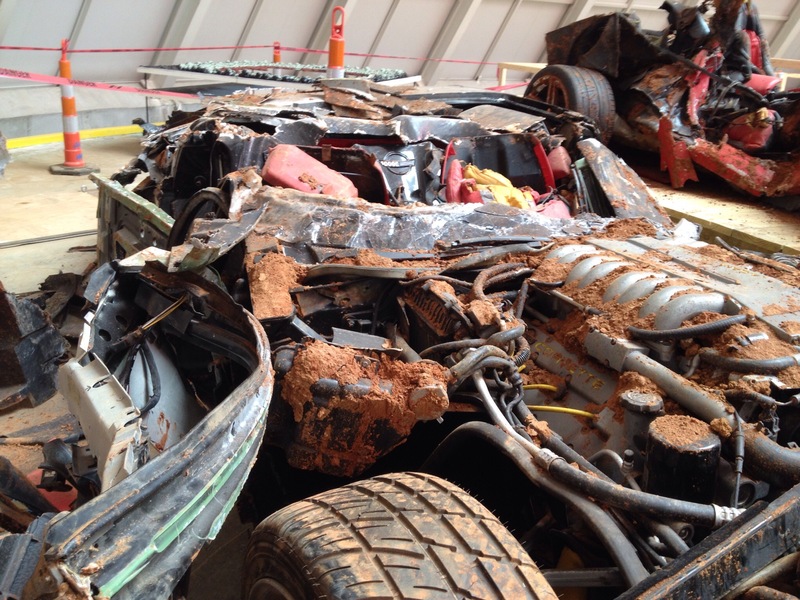 This particular entrant is named Luvthatmustang. 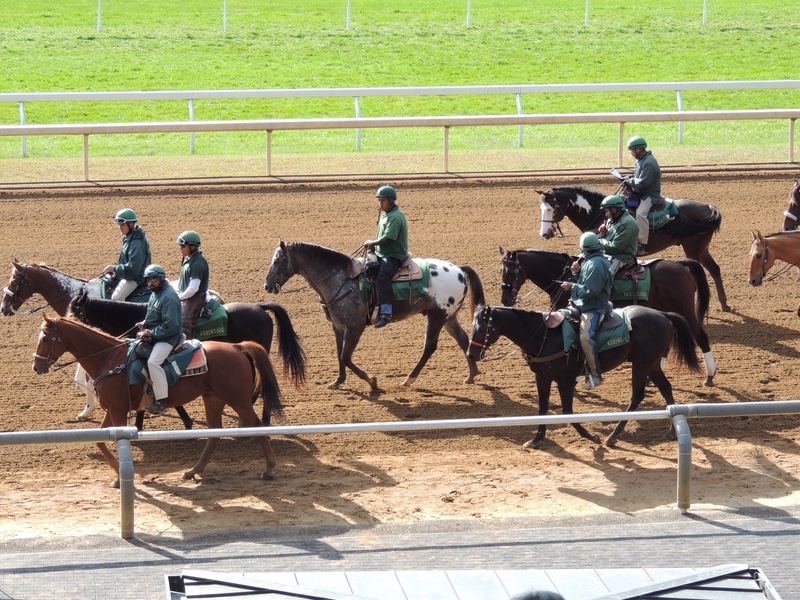 As the horses came around, I spotted a horse named Vanilla Score that was not favored at all…having 12 to 1 odds. Still, the horse seemed ‘bothered’ to me. That, and the fact I like vanilla…well, I dropped $2 each for it to win/place/show. 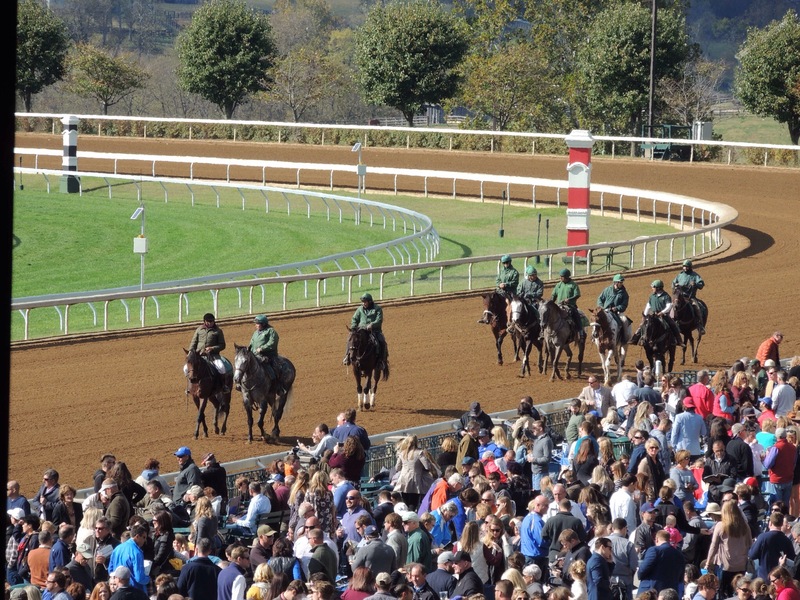 Holy cow…that’s my yellow horse in front on the backstretch! Danged if my horse didn’t come in second, which was just fine with me. 😎 I came away with enough money to play the rest of the day on the winnings, which was nice! The manicured hedge spelling out Keeneland in the infield. 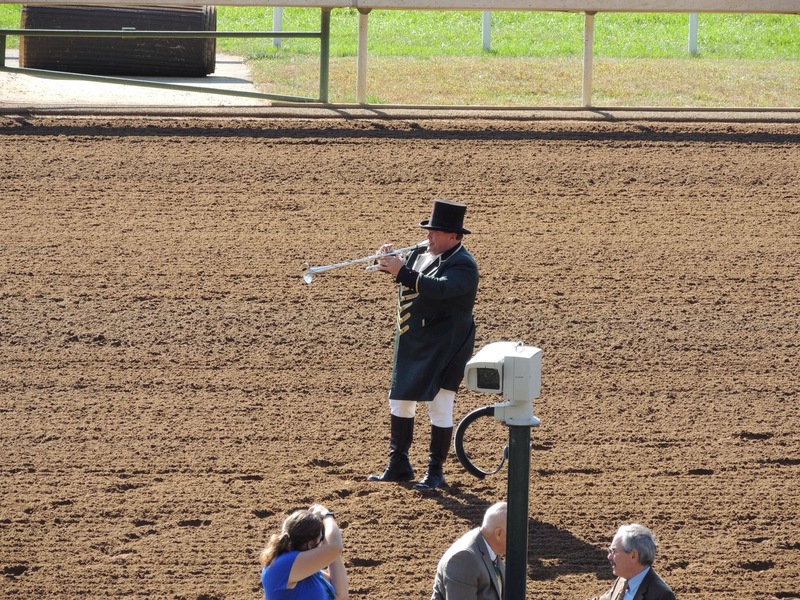 The bugler calls the horses to post in the gate. The lead horses returning from the start of one of the races. These are the horses that accompany the racers to the gate to help keep them calm. Emily and Diana discussing their mutual love of teaching during a break in the action, while Reed checks his race program. Reed and Jerry deciding who to place their money on. This was definitely a huge social event with people dressed every which way. 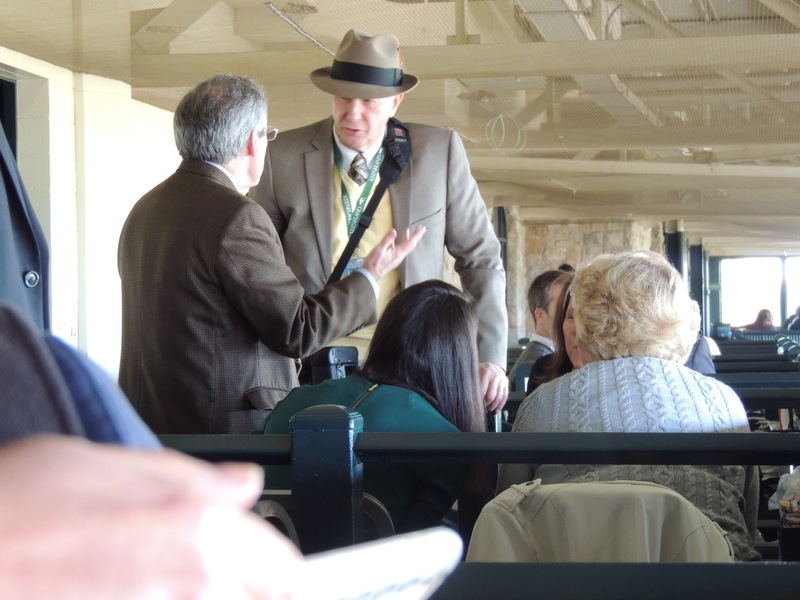 …but also plenty of folks dressed casually. All in all, it was a great way to spend a beautiful day. 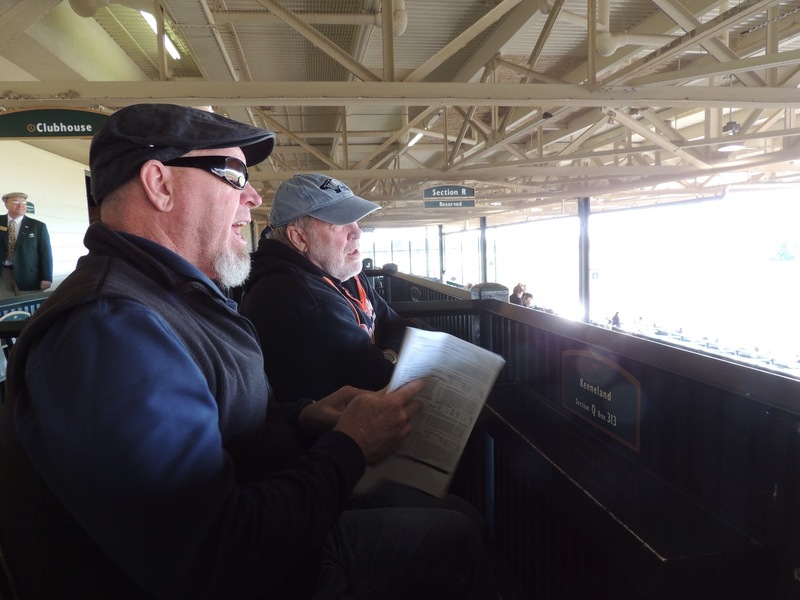 Thanks to Reed for taking the mystery out of thoroughbred racing for us. 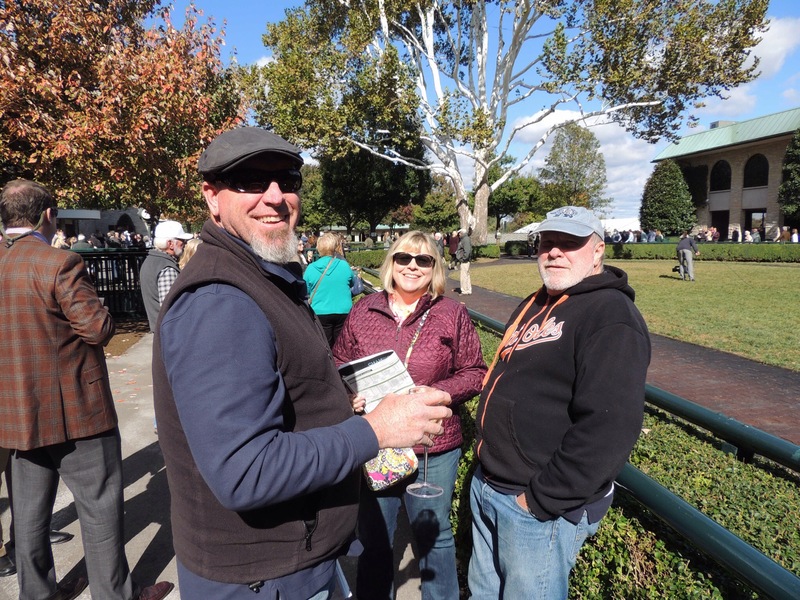 😀 We look forward to returning to Keeneland again someday! There are pre-Black Friday deals at Amazon…time to get your holiday shopping done early by clicking HERE! When the State of Kentucky is mentioned, one of the first things to come to mind is horses. There is one horse for every twelve people within its’ borders. But not to be overlooked is Kentucky’s chief export, bourbon. 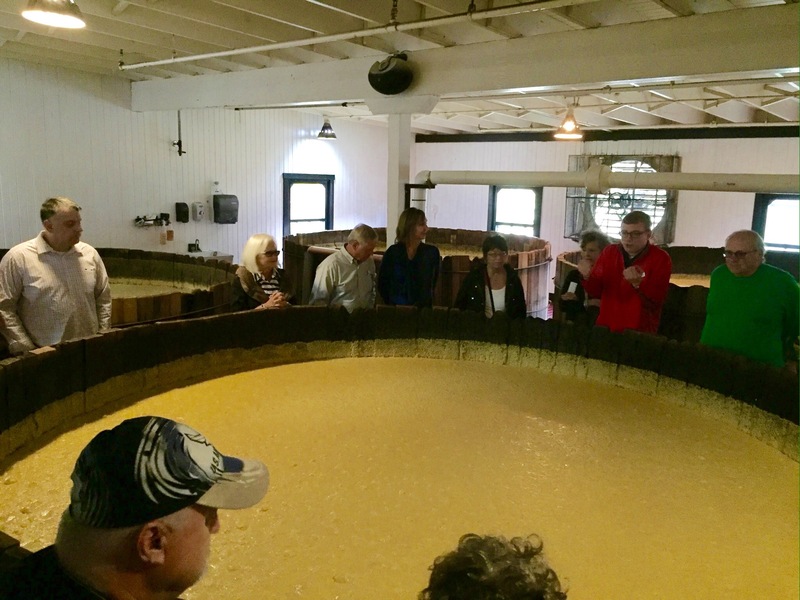 There are 1 million more barrels of this uniquely American whiskey than there are residents living in the Bluegrass State. In fact, they even outnumber the humans and horses combined! Even if you never take a sip of this sweet whiskey, the story behind it is fascinating. The immediate question that comes to mind is: Why is there so much bourbon and whiskey being produced in Kentucky and Tennesee? Well, the answer to that is the water quality. Both states have a layer of limestone that filters the ground water, and there is virtually no iron in it. Iron content is highly detrimental to producing whiskey. 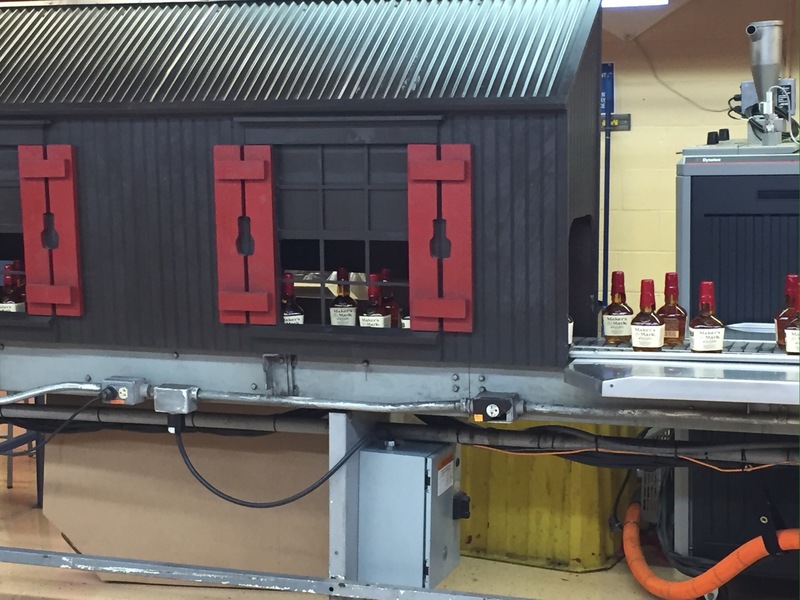 So what is it that makes bourbon bourbon, and not just whiskey? Well, a number of legal requirements must be met. It must be 51% corn based, made and aged for a minimum of two years in new, charred oak barrels and be made in the United States. 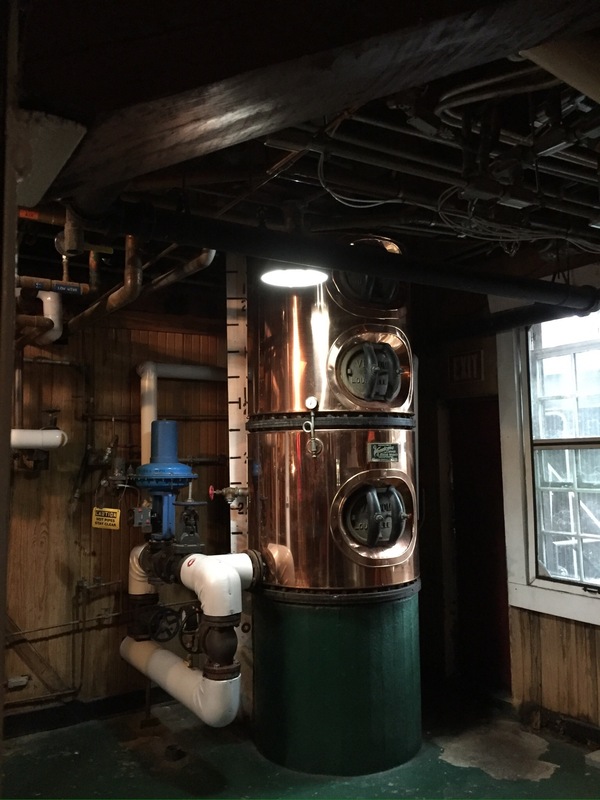 Also, the distilling process must not allow the product to exceed 160 proof when leaving the still, not enter the barrel more than 125 proof, and be at least 80 proof at bottling. No additional flavoring may be added, and only water can be used to lower the proof. With these stringent standards, a distiller must become creative to make their product stand out from the others. One of the best at marketing and producing a unique product is the Samuels family, crafters of the brand Maker’s Mark. To understand the history of this brand, you have to go back a long way. Founder Bill Samuels, Sr. was the 4th generation to distill bourbon in the family. He actually was the 6th, but the first two didn’t pay taxes, so his wife Margie said they didn’t count. 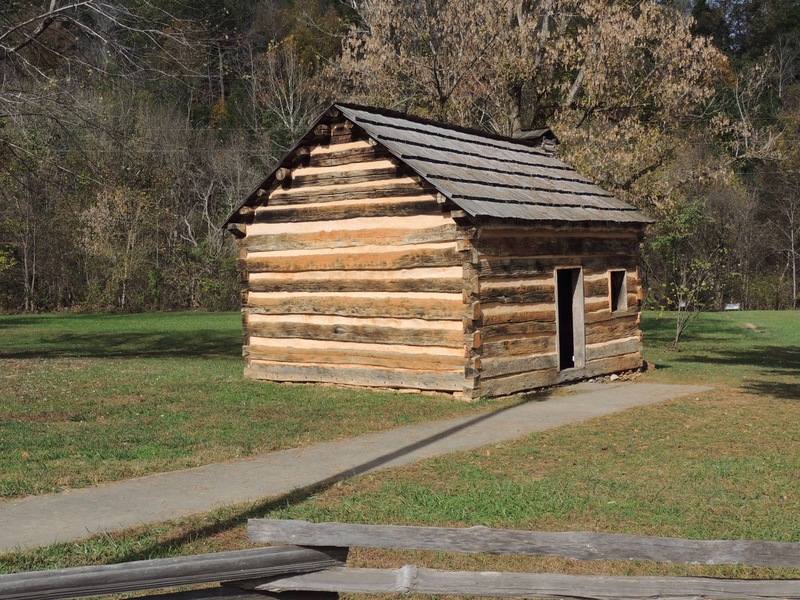 In 1953 he purchased the run down Burks Distillery, just northeast of Loretto, Kentucky, for $35,000. That operation had the distinct honor of being the oldest producer of bourbon in the world, beginning back in 1805. While it isn’t clear if any of the buildings from that original operation still exist, some of them are definitely old. The roads to get to the property were (and still are) narrow and winding. So with bourbon requiring a minimum of two years of aging, the question of how to come up with a new recipe was raised. Samuels developed seven different concoctions using variations of wheat instead of rye, as the latter tends to impart a spicy note into the product. Margie proceeded to bake loaves of bread from each one. The loaf that tasted the best to them was the one that used red winter wheat. With the recipe in hand, they had to come up with a name for their bourbon. This is where Margie stepped in and set them on the path to success. She was a collector of English pewter, and she knew each pewter maker had their own distinctive mark on the bottom of each piece. 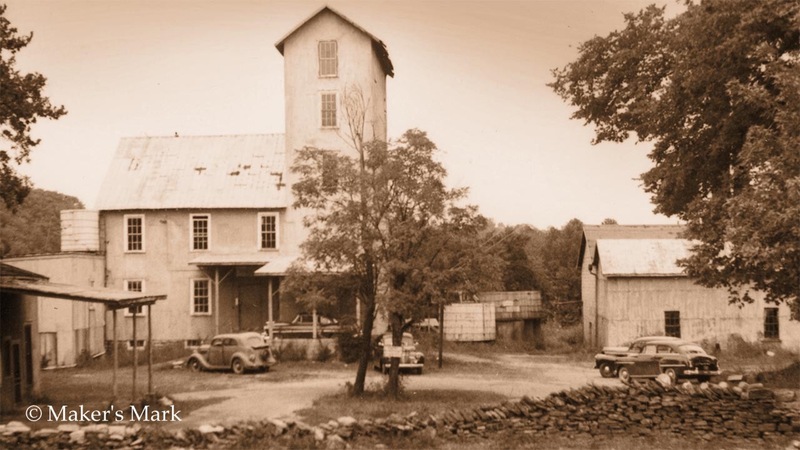 She developed the round maker’s mark with a star to signify the Star Hill family farm and distillery, and the ‘S IV’ to commentate that her husband was a fourth generation of Samuels to be a distiller. She designed the label and lettering to look hand crafted, lending authenticity to this new brand. Spelling whiskey without an “e”, is a tip of the hat to the Samuels’ Scottish heritage. From there, she designed a unique bottle to the bourbon industry, combining both square and round elements, similar to a cognac bottle. To top it off, she insisted on hand dipping the neck of the bottle in red wax to add a distinctive look. At first, Bill didn’t like it, as he felt it made it too difficult for his customers to open the bottle. When Margie insisted they use it, he had a pull tab made that would withstand the 350 degree wax that allowed its easy removal. The dripping wax now carries a U.S. patent. With all the pieces in place, production commenced. 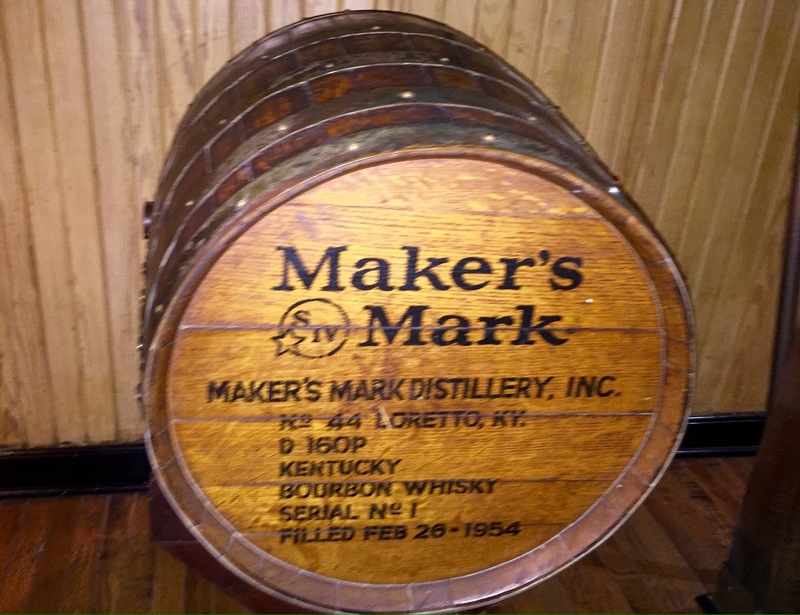 The first barrel, proudly displayed in the distillery, was filled on February 26, 1954. The first bottle was filled on May 8, 1958. Since then, the aging process has been extended to between 5-3/4 and 7 years, depending on when the tasters determine the barrel is ready. 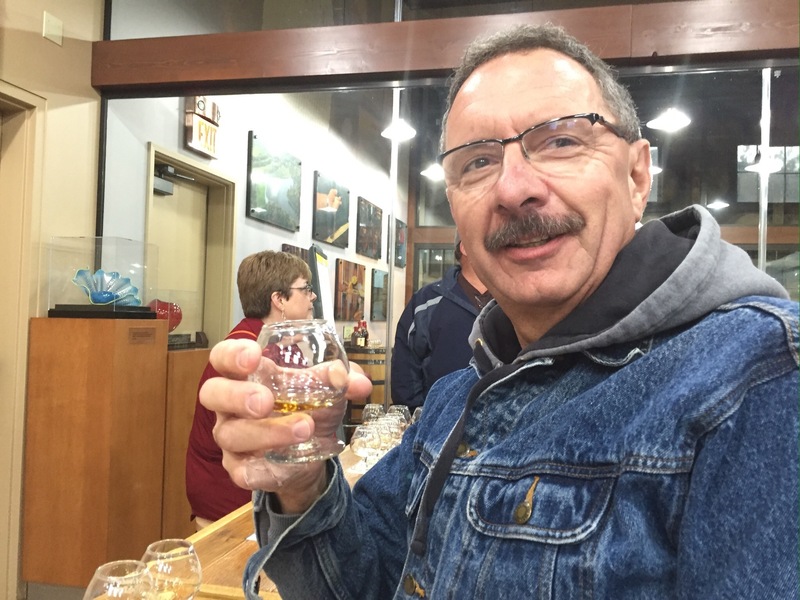 On Friday, October 21, Diana and I drove up to Loretto for a tour of the distillery. We really didn’t know what to expect, as we had never been to one. 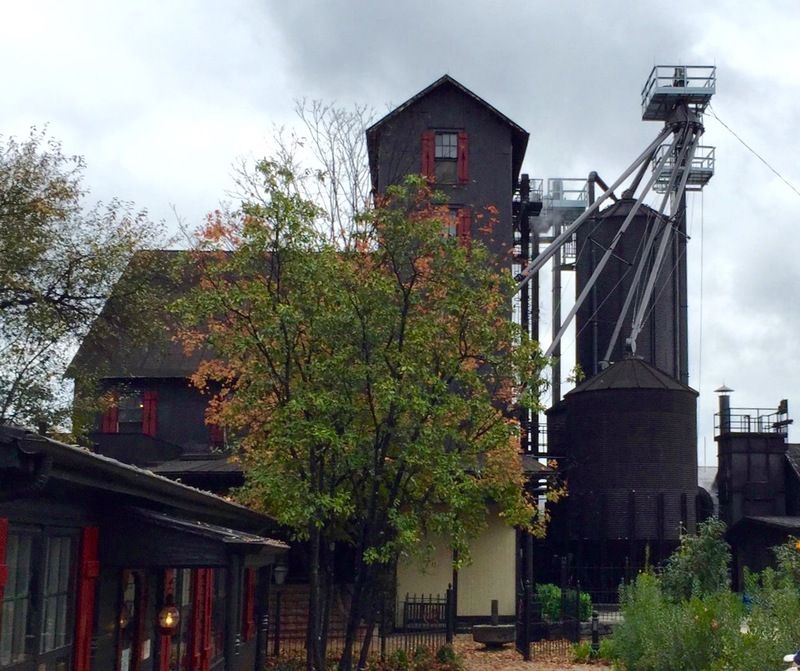 What we found was a setting very similar to the wineries of northern Michigan, only with a quaint, historic twist. 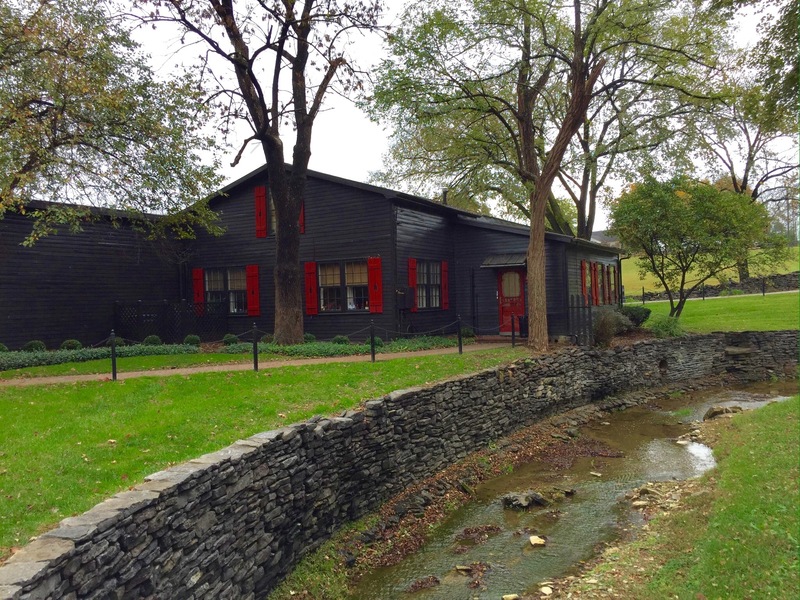 Nestled into the hills of Happy Hollow, the Samuels’ Star Hill Distillery is downright charming. This is the same building shown in the sepia-tone photo at the beginning of the post. It’s the actual distillery that Bill Samuels, Sr. purchased back in 1953 and is a National Historic Landmark. All of the buildings on the property are painted chocolate brown, and the windows are outlined with red shutters….the same color as the sealing wax…with cutouts of the Maker’s Mark bottles in them. 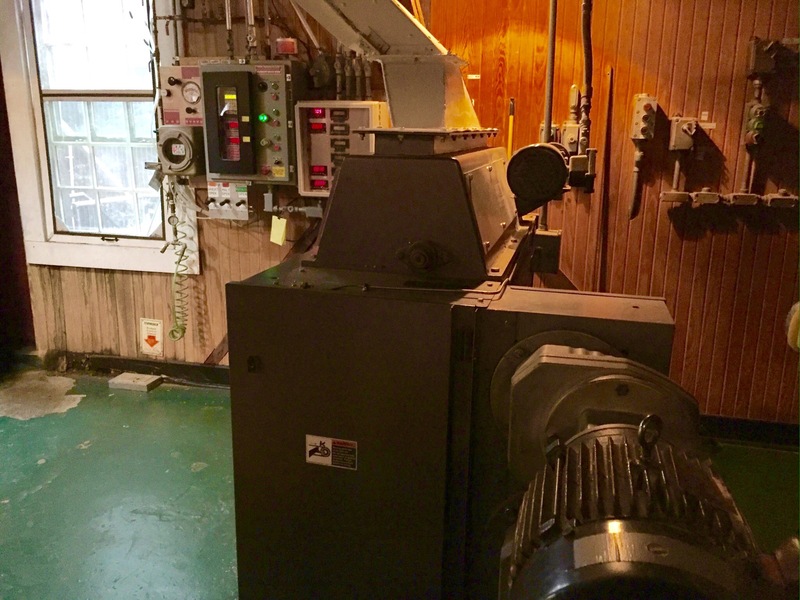 Stepping inside the distillery building, one of the first things you see is the roller mill …. 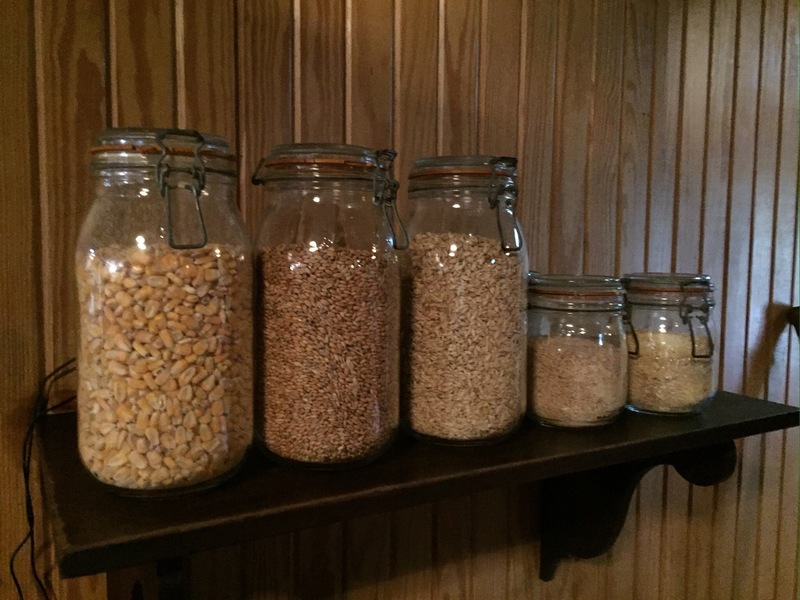 …that reduces the grain from what is seen on the left to the smaller jars on the right. The mash is then introduced into the still, which seperates the alcohol from the mash through heat. It is then distilled a second time in a still referred to as a doubler. 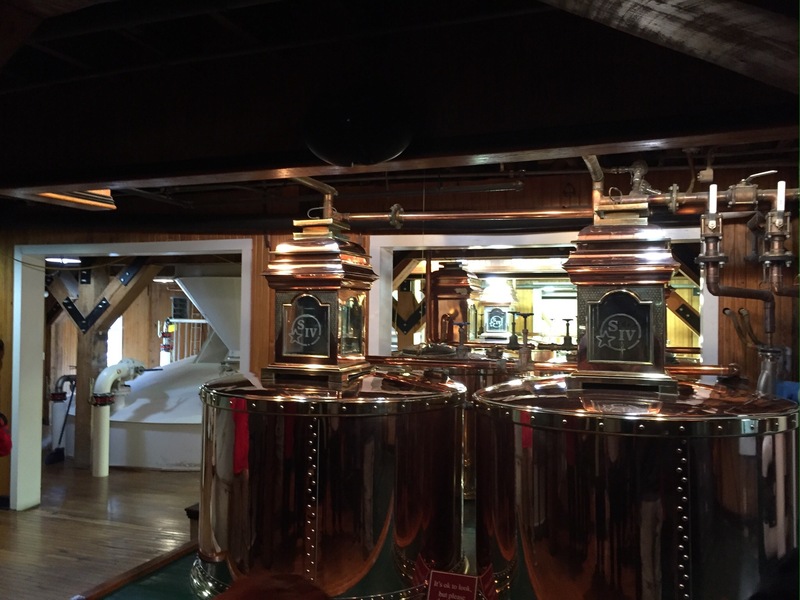 From the doubler, the alcohol runs into these spirit safes, which are large copper receivers. There is a hydrometer in the glass portion of each safe that measures the alcohol content of the spirits entering the receiver. The stillman’s job is to know when to seperate the undesirable heads and tails (the first and last portions of the run) from the pure spirits in between. He or she uses only the hydrometer and a thermometer to do so. The name spirit safe comes from Scotland, where the tax man held the only key to the padlock at the top…thus keeping the distillery workers from siphoning off pure spirits before the government had a chance to tax them. At this point, the product is referred to as white dog….or what most of us would have called ‘white lightning’. Samples are diluted for the tasting panel and, if the batch passes muster, it is put into the barrels for aging. Remember from earlier in the post, these are new American oak barrels, and they are charred or toasted to a selected degree to allow the spirits to blend with the flavors of the wood. That is required by law. The barrels are stored in huge warehouses, called rackhouses. 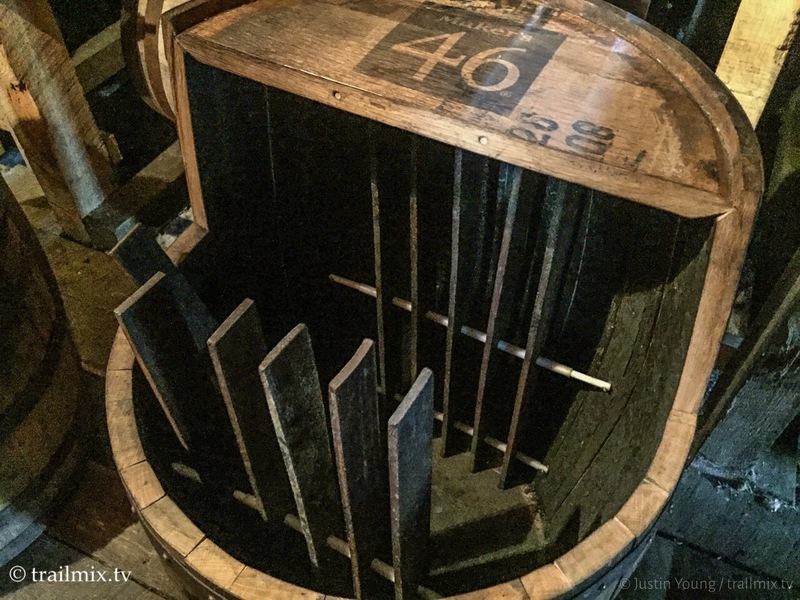 At Maker’s Mark, they rotate the barrels from to top to the bottom of the warehouse throughout the aging process, so the differations in temperature can be evened out. 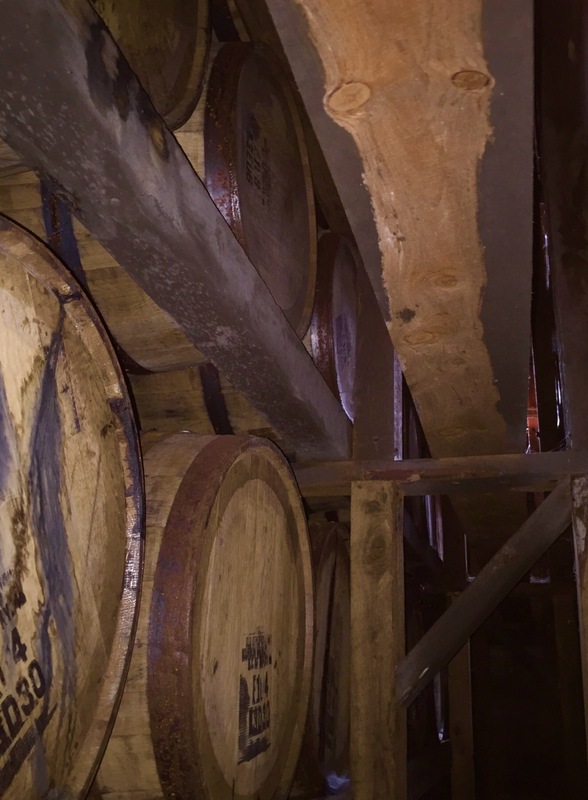 Some of the bourbon evaporates through the pores of the barrel staves, which is referred to as the angel’s share. 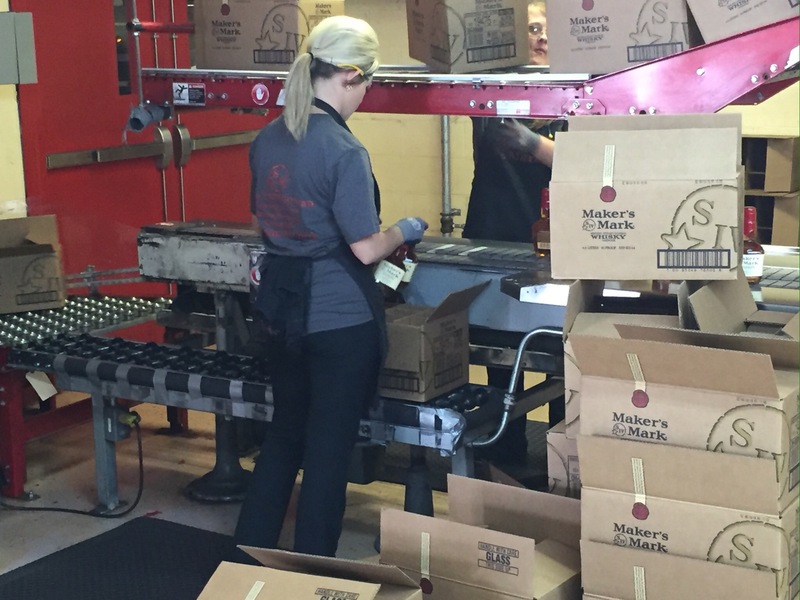 Judging by the sweet aroma of the rackhouse, there are some very happy angels in Kentucky! 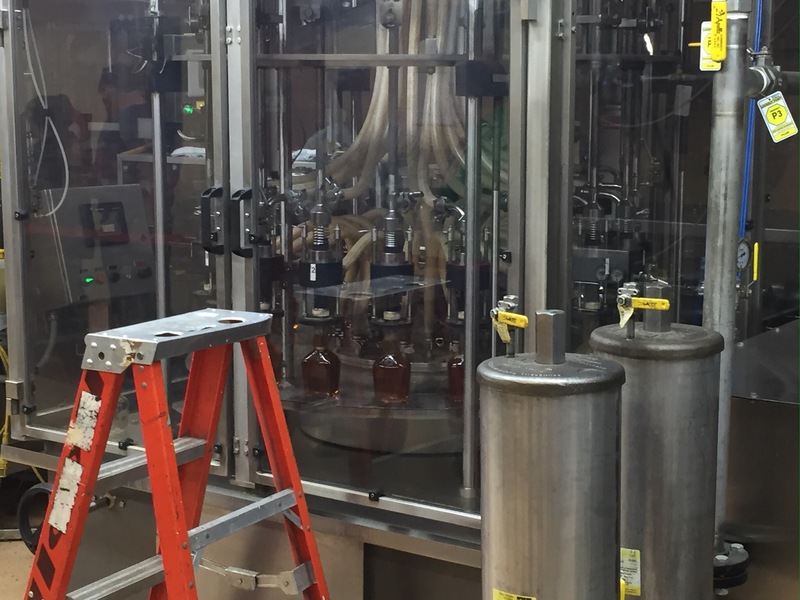 Once the aging process is complete…again, determined by a panel of tasters… it’s off to the bottling line! 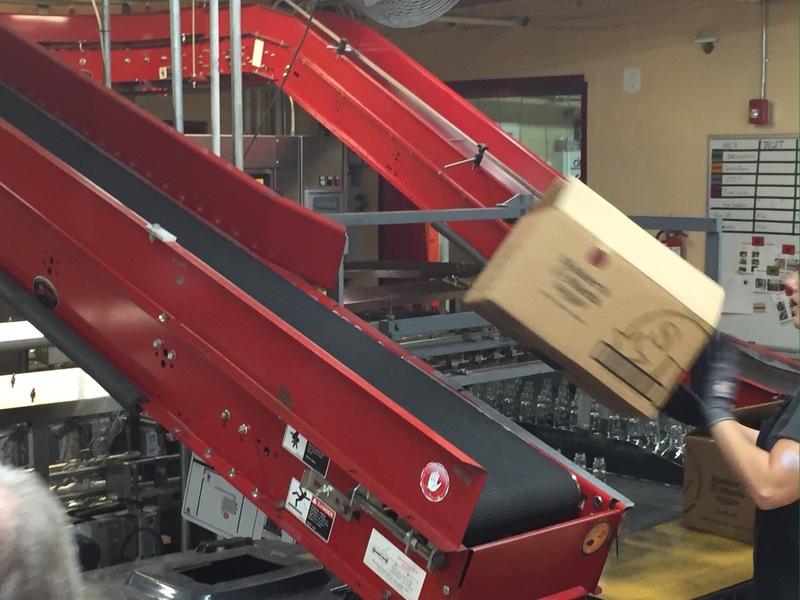 First step is to unload the bottles and put the boxes on a conveyer for use at the other end of the line. 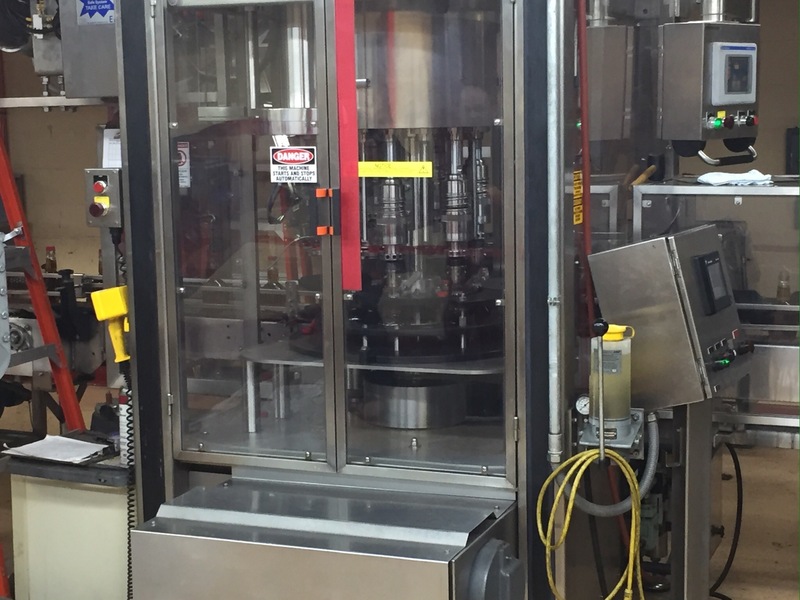 The machine then flips the bottle over and rinses the bottle out with none other that Maker’s Mark. …and labeled. It is here that I should mention that the Margie Samuels-designed labels are printed and cut out on the property, using an archaic Chandler & Price printing press and a hand operated die cutter. 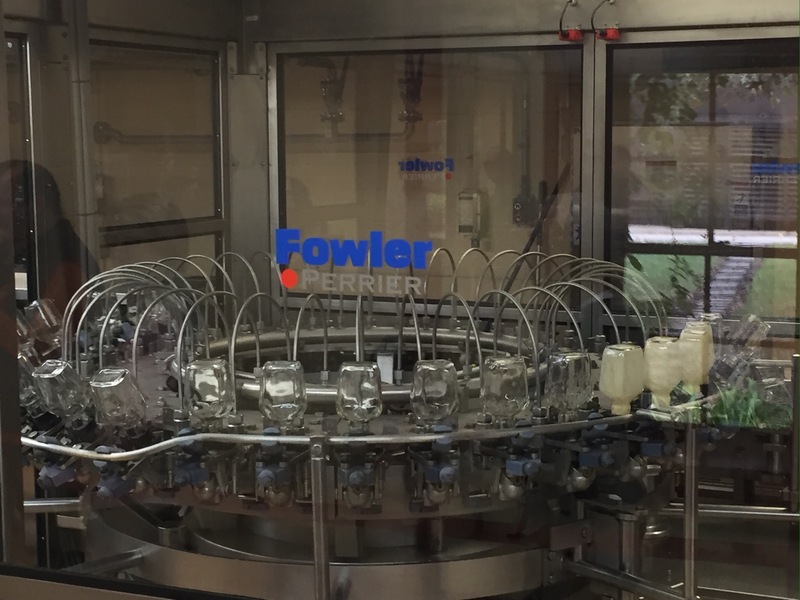 The bottles are then run through a chiller to set the wax. From there, they are returned to their boxes and sent on ther way! Our next stop was the tasting room. 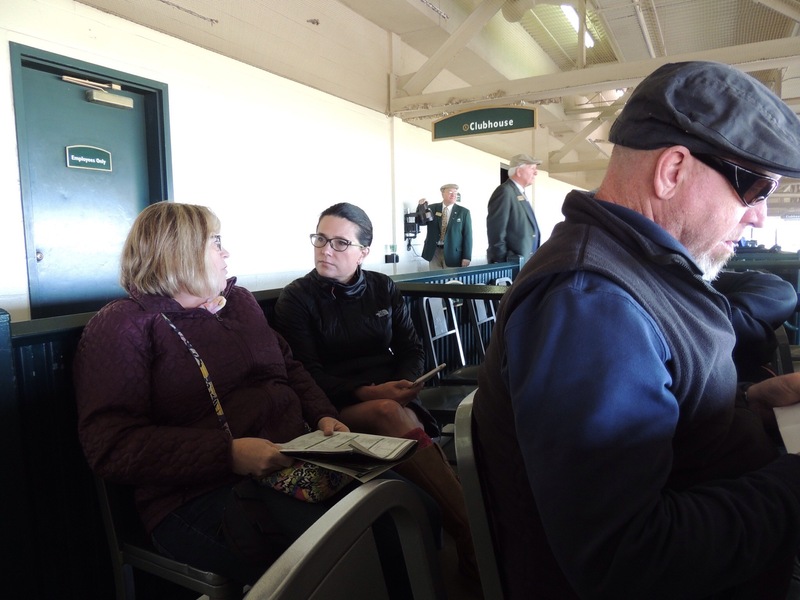 We were given 4 samples: Maker’s White (which is basically White Dog, diluted to lower the alcohol content), Maker’s Mark, Maker’s 46 and a version of Maker’s Private Select that was made for Keeneland Horse Track in Lexington. Maker’s White isn’t really a bourbon…as it hadn’t been aged…but it was pretty smooth. 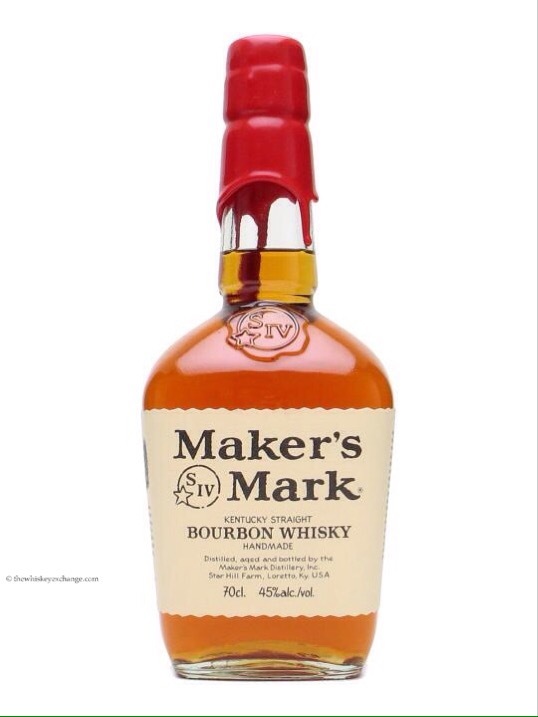 Maker’s Mark is sweet, smelling a bit like caramel and vanilla. It is smooth as it hits your palate, and it is warm on the back of your tongue. The other two were very good, albeit a touch heavier. 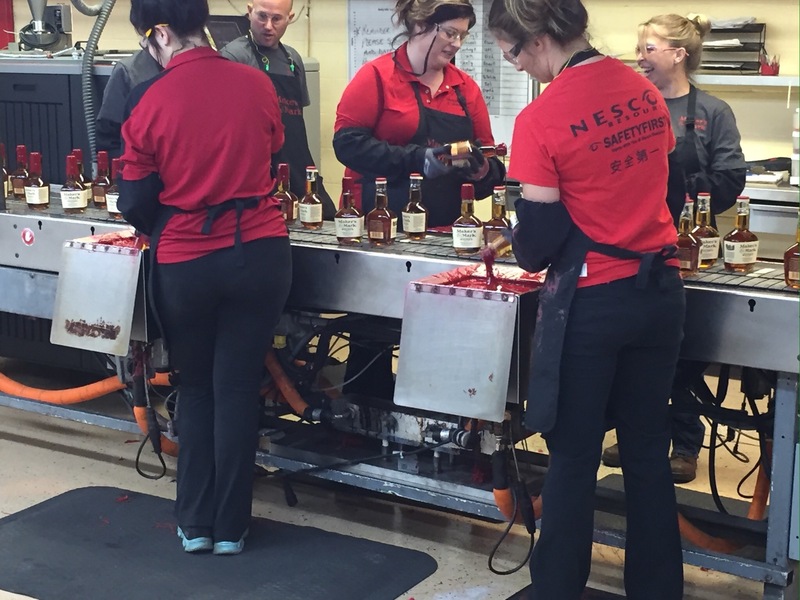 We can see why Maker’s Mark has such a loyal following. After a quick trip to the gift shop…. 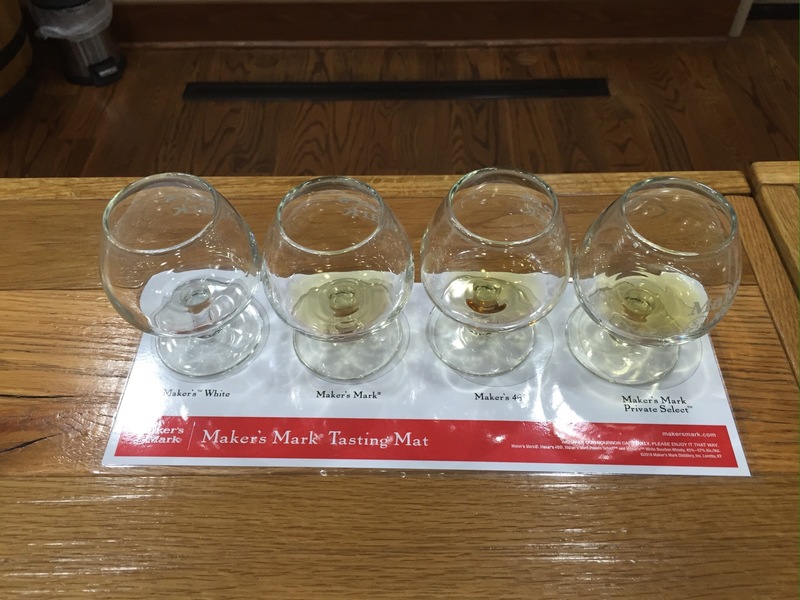 where anything Maker’s Mark was available, including being able to dip your own bottles in wax….we were on our way. After we left the distillery, we made our way into the town of Loretto, to see what was there. There wasn’t much to see, until we drove to the other side of town and our jaws dropped. 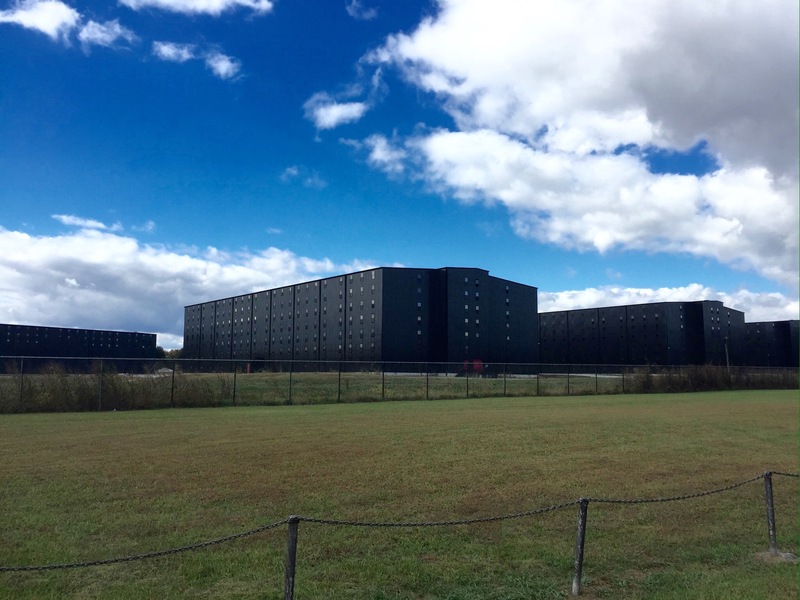 There was a campus of at least 20 giant, chocolate brown rackhouses in front of us, with more under construction! I guess if a company ages their product for an average of 6 years, they have to store a lot of barrels! Very impressive. So cheers to a really fun day at Maker’s Mark! 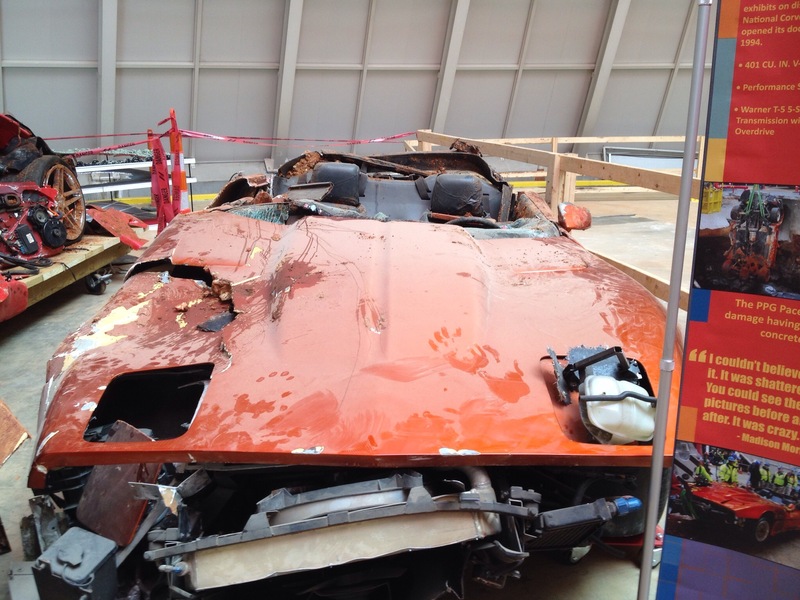 We didn’t know what to expect, and we thoroughly enjoyed our tour. 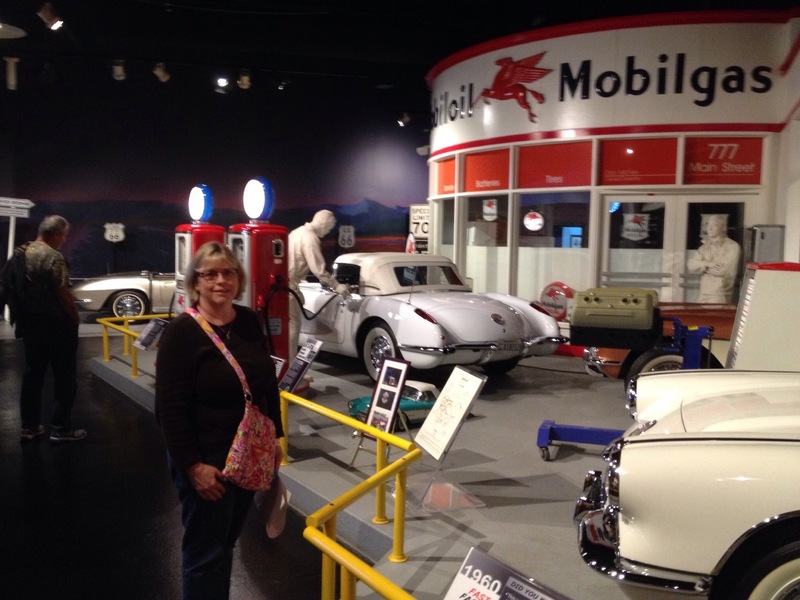 When we decided to retire, become fulltime RVers and travel North America, we knew we would want to supplement our retirement savings on occasion. That would be accomplished through ‘work camping’, which involves some sort of work being done in exchange for a campsite. Our jobs the past two summers at Wild Cherry provided us a free place to stay in a fabulous location for two easy days of work each week. Many of these campgrounds offer fulltimers additional compensation after a certain number of hours to entice us rolling retirees to come and work for them. Recognizing the work ethic this segment of society has to offer, several companies that have nothing to do with camping are jumping on this bandwagon. One of the biggest examples of this is the online retailer, Amazon.com. 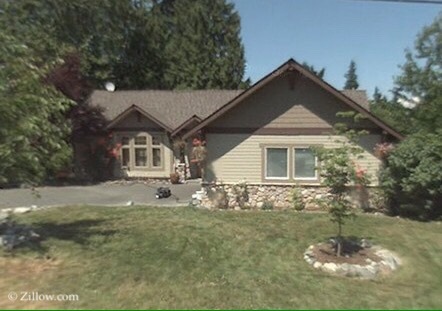 To pass along a little history, Amazon.com was founded as Cadabra, Inc in 1994 by Jeff Bezos in his garage in Bellevue, Washington. One of his lawyers misunderstood the name to be cadaver, so Bezos changed it to Amazon, as the Amazon River was “exotic and different.” It’s also the biggest river in the world, just as he hoped his company would be. Furthermore, he noted that it was at the top of the alphabet, thereby appearing at the top of an alphabetized list. The company went online in 1995 as a book retailer (I remember that!) and eventually began selling everything from A to Z with a smile, as indicated in their logo. I wonder where he got that idea? 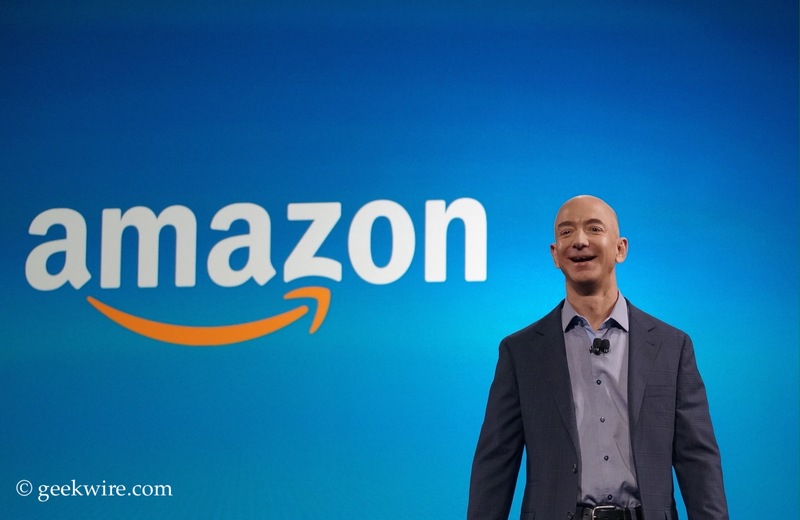 Amazon survived the dot com bubble burst and turned a profit in the fourth quarter of 2001. The company went public with an initial public offering of stock at a price of $18 a share in 1997 (actually equal to $1.50 after three stock splits early on) and is now trading at $822 a share. It is mind boggling to think that a person who would have invested a mere $2000 in the company in 1995 would be a millionaire today from just that one transaction! In 22 short years, the company has over 100 billion in annual revenue (2015) and over 250,000 employees in 16 countries….and it all started in a garage. With that kind of explosive growth, logistics come into play. Fulfillment centers (known from here out as FC) need to be placed near airports that are serviced by shipping companies, and also near a stable workforce. Campbellsville, Kentucky was a perfect choice, as a 1998 closing of a Fruit of the Loom textile plant left a fairly new building vacant and over 800 workers unemployed. It was also very close to the Louisville airport (airport code SDF), also known as Worldport, United Parcel Services main hub. The new FC in Campbellsville opened in May of 1999 and was named SDF-1…or the first FC to ship out of that airport. Being centrally located in the United States, SDF-1 played an important role in Amazon’s success. Amazon started offering items other than books in November of 1999. It wasn’t long before consumer buying habits started shifting from brick-and-mortar stores to buying goods online. In 2005, the term Cyber Monday came into existence, referring to the first workday after Black Friday, when many people sit at their desks and do their holiday shopping instead of their jobs. The Amazon FCs started feeling the pinch, and armies of temporary employees were brought in to help with the increased workload. 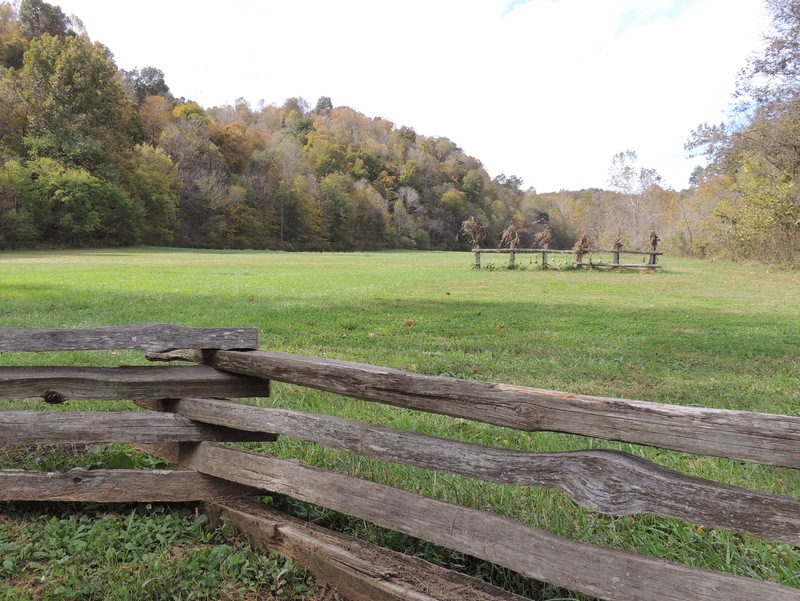 In Campbellsville’s case, many were bussed in from Louisville and housed in local hotels. 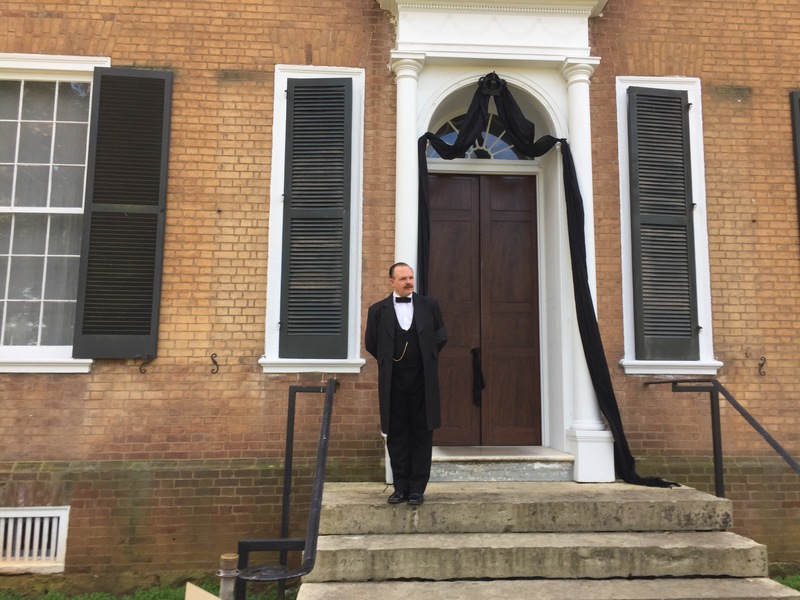 As is often the case with temps, quality and attendance issues arose…and sleepy little Campbellsville was having to deal with a segment of society that tend to cause problems. 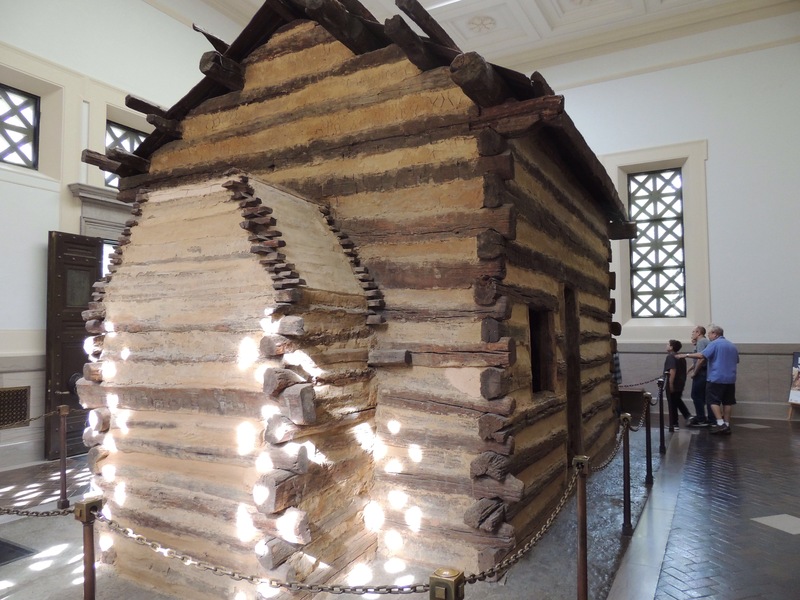 In 2008, the FC in Coffeysville, Kansas began a pilot program to hire work campers to help with the holiday rush, known in Amazon circles as peak season. That program has since been expanded to several other FCs…including Campbellsville…and has been given the name Amazon CamperForce. The upside for the company is that the majority of these workers are retired and have a great work ethic and attendance. The only drawback is that they tend to want to change the Amazon way of doing things, as they come from careers in which they did things differently. That fact is stressed at orientation, saying “it’s a job, not a career”. The company sends recruiters to RV shows around the country to recruit new workers each year. 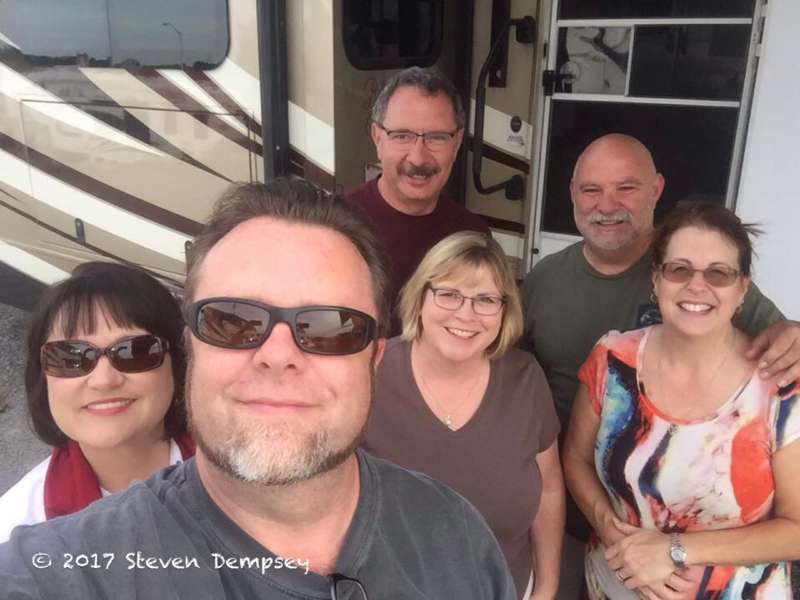 We put our names on the list at the Tampa RV Show in January, after reading the accounts of several friends and family members who had done it in the past. We already had ties with the company as advertisers through our Associates account (located at the bottom of each post), so we thought it would be fun to see what makes the place tick. 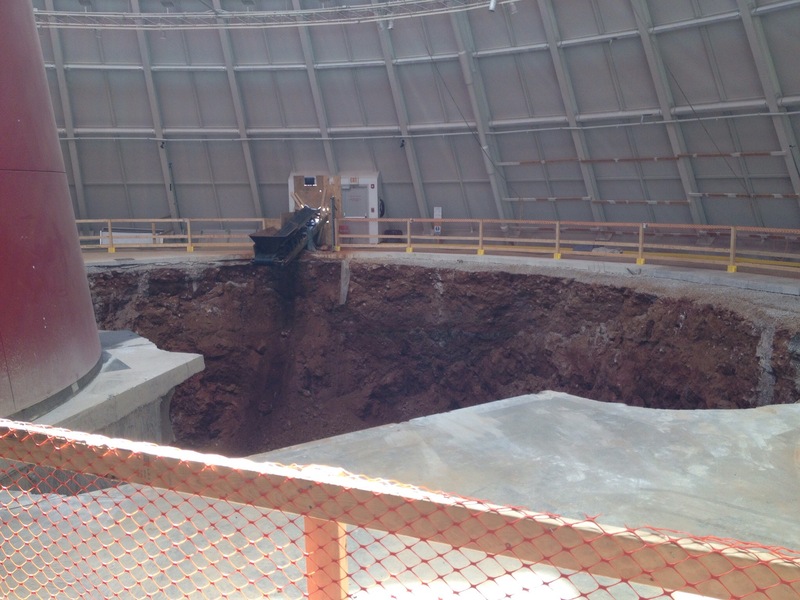 We arrived on October 8 to find a newly remodeled facility. Our friends Peg and Michele who worked last year pointed out that the building is vastly improved, and is much cleaner. The regular workers (known as Amazonians) seem genuinely happy that we are there, probably because the CamperForce can be counted on to get the job done without too much drama. Our first morning was orientation, led by a very entertaining and informative gentleman named Kelly Calmes. That was followed by safety school in the afternoon. The remainder of the first week was 5 hour work days in our departments, meant to harden us for the 10 hour days that were to follow. We were assigned to packing, which I will talk more about in a future post. Looking pretty good at 6:15 AM for Breast Cancer Awareness Week! For now, I will leave it at this: our first week went really well. We found the work, the environment and people enjoyable. 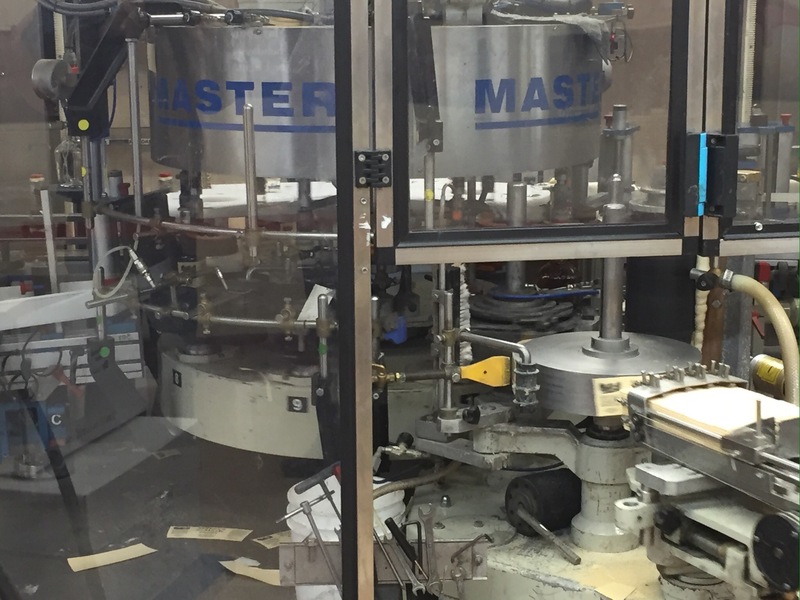 We are amazed at the process, and I kept finding myself looking back to my career in manufacturing and thinking ‘THIS is how we should have done things’. Granted, their system is not perfect…but when you consider that almost every package they deliver is on time and correct, it’s pretty darned slick.